Hi there! 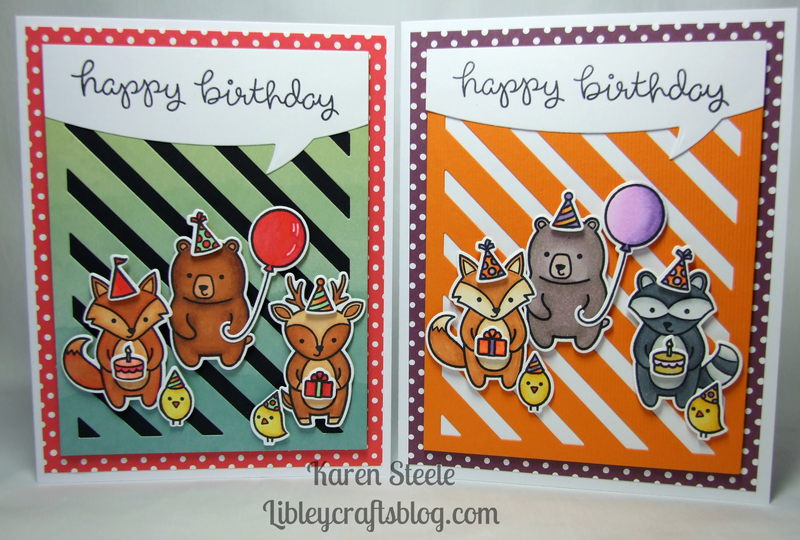 I’m back today with 2 cards that I have made using the Party Animals stamp and die set and Holiday Party Animal stamps and dies from Lawn Fawn – love these sets! 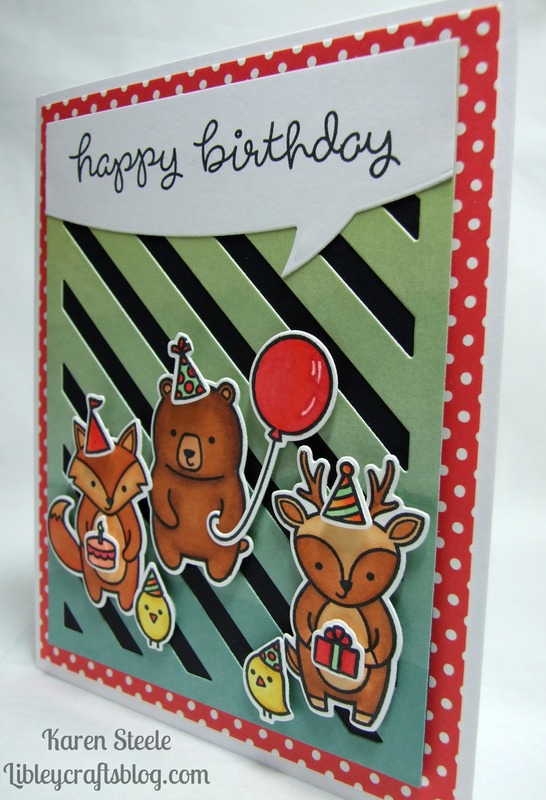 Again, like my other cards previously this week, this features the Striped Backdrop die also from Lawn Fawn. The layout using this die has been the same every day but the cute critters have changed! Here I have also used the Speech Bubble Border die from Lawn Fawn which I think is great! I also used ‘Lets Polka in the Dark’ papers by Lawn Fawn, black cardstock, green paper – American Crafts – Color Crush, orange cardstock from Lawn Fawn and Spectrum Noirs. 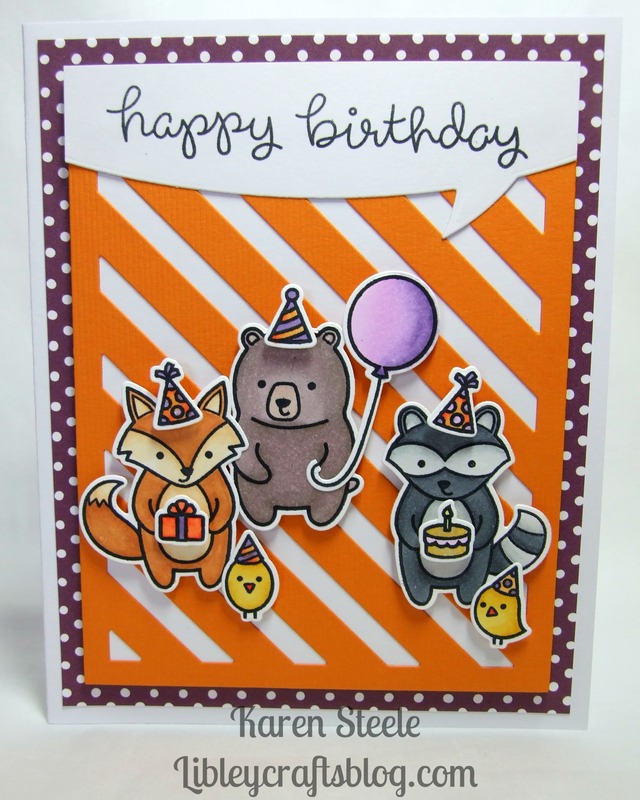 You can see that I used the raccoon from Lawn Fawn Holiday Party Animal on the orange version just to mix it up a bit! < Previous ‘Best Fishes’ Part 2! Next > “Happy Birthday to Moo!”…. I love the idea of a gate-crashing racoon! Every party should have one. Great cards again Karen! More Lawn Fawn goodies! Love those fun critters! Awesome birthday cards, Karen! Oh goodness, how fun are these critters?! I’d love to join in on the party. Great, amazing coloring. These are my favorites – love the scenes – the background die cuts have been perfect this week!! These cards are so cute, perfect for both children’s and adults’ birthday cards. I’d love to get my hands on these stamps.